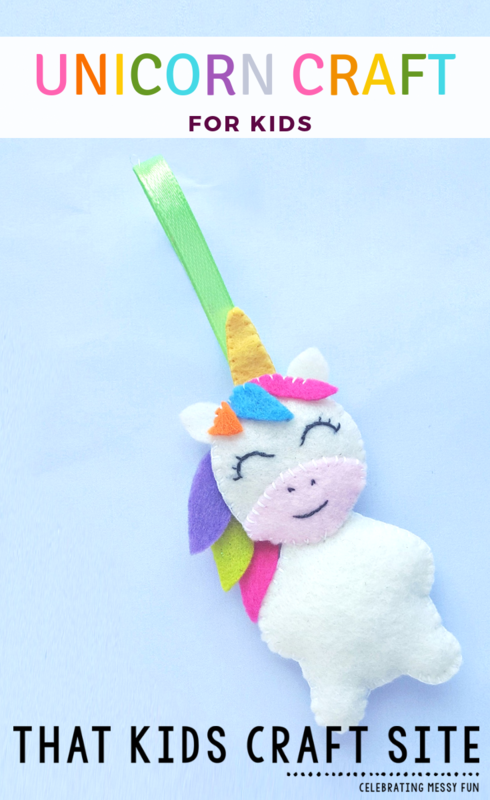 Decorate the with this adorable Felt DIY Unicorn Craft Ornament that can be sewn together in no time at all! It’s the perfect tween craft! We love unicorns, so last Christmas we were super excited to make this felt DIY unicorn craft ornament for the Christmas tree. The great thing about it is that it can be made and used any time of year! Need a backpack pull? Here you go! Want a cool unicorn keychain? This will work! It’s an adorable unicorn craft and can be made in any color to match your unicorn preference. One of the things that I love about it is that it was great sewing practice for my tween daughter. She’s always loved making crafts, but hasn’t spent a lot of time sewing by hand. This unicorn ornament gave her the practice she needed (hello, homemaking skills!) and it looked amazing on our tree this year. I’ve included the printable template for the unicorn ornament in the directions below, so that it’s easier for you to create your own. Just print out the template and away you go! Have a blast creating your unicorn craft! Choose the felt colors that you want to use for the body and ears. Trace the pattern on the appropriate pieces. Cut the pieces out of the felt. Take 1 cut-out of the head (the round cut out) and stitch the semi-circular part on the bottom side of the head cut-out. Use the black thread and needle to stitch the eyes, nose and mouth. Take the 2 cut-outs for the horn and place them together by matching all sides. Stitch around the sides to join the pieces. Fold a piece of ribbon in half. Take the other head cut-out and place it on a flat surface. Place the 2 ear cut-outs along the top side of the head; place the open ends of the folded ribbon between the ears. Make sure that the ears and the ribbon overlap the head cut out by 1 cm (at least). You are looking at the inside of the unicorn’s head. Carefully place the horn on top of the ribbon, again making sure that the horn overlaps the head by 1 cm. Now take the front piece of the head (the stitched one); and place it on top of the other head cut-out. Place the 3 hair cut-outs along the top side of the front head piece, arranging them nicely. Prepare the needle and thread. Stitch the ears, ribbon, horn, hair cut outs and both head cut outs together along the top side. Keep a small opening on the bottom side (1-2 cm will do) of the head for stuffing. Stuff the head with enough cotton through the bottom opening to give it a fluffy look. Now take the body cut-outs and stitch them together around the sides. Stuff the body with cotton through any opening before closing the stitch. Take the stuffed head and bring the needle and thread attached with the body near the neck (on the top side of the body). Insert about 1 cm of the neck inside the head through its bottom open end. Simply stitch the bottom side of the head and body parts together to join them. Arrange the 3 patterns of the tail together. Make sure that all 3 pieces overlap each other. Stitch the tail on the back side of the unicorn body to complete your ornament. 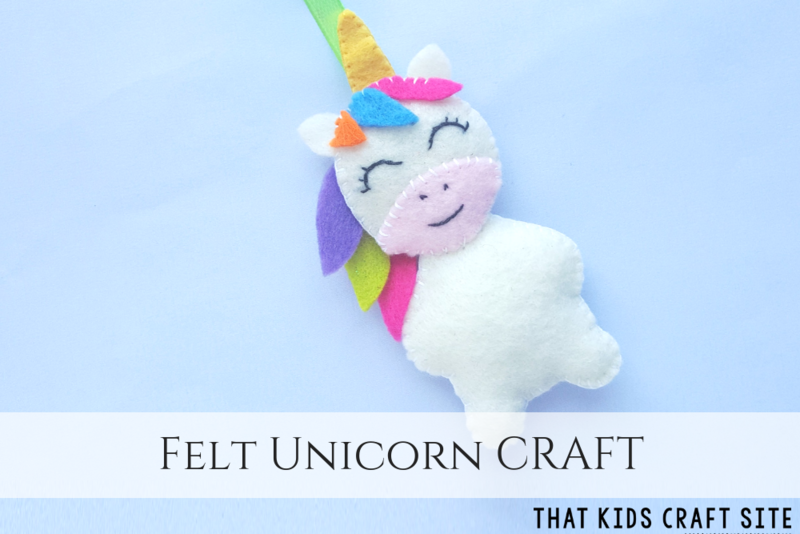 The DIY felt unicorn ornaments are perfect for enjoying at home, selling at craft or holiday fairs, making as a Girl Scout Troop craft, and more! Have a blast! As always, we would love to see how your project turns out, so tag us on Instagram @ThatKidsCraftSite! We can’t wait to see your unicorn ornaments!